Microsoft ALWAYS offer developers strong and great support/guidance, this point is really respected! 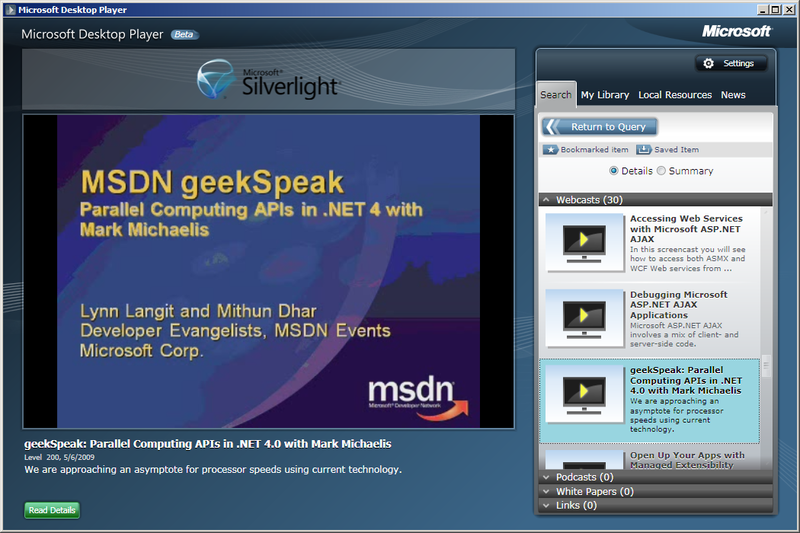 In Silverlight 4, Out Of Browser with elevated permission is significantly improved, now the OOB application has more privilege in accessing system resources such as the ability of accessing Isolated Storage, manipulating COM objects, access local registry entries, or even invoke Microsoft Speech API to phonate. 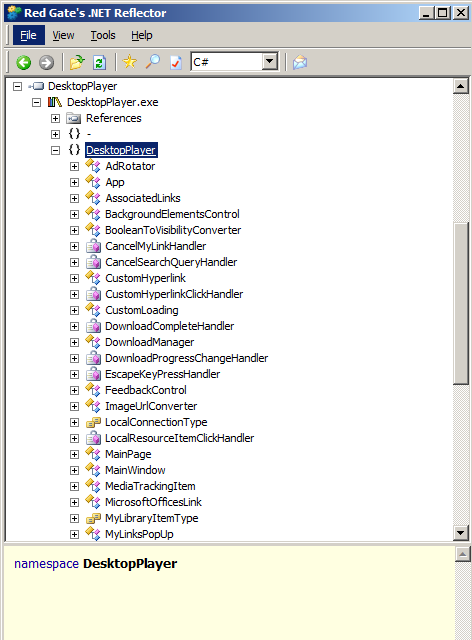 Microsoft gives Silverlight 4 OOB applications ability to request elevated trust. You can configure out-of-browser applications to require elevated trust. After installation, these trusted applications can bypass some of the restrictions of the security sandbox. 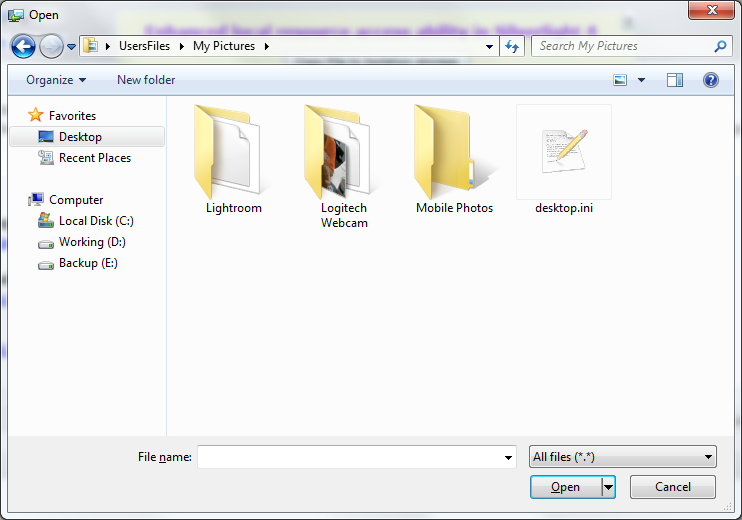 For example, trusted applications can access user files and use full-screen mode without keyboard restrictions. A new concept coming from .NET 4.0 called “late binding”, the C# key word: dynamic could be use to declare a undetermined type at build time, during runtime, Microsoft.CSharp.RuntimeBinder will do dynamically building. My post is going to concentrated discuss about elevated trust, so read the articles below if you have any issues about creating OOB and request elevated permission. Let user choose some file(s) and then copy them to isolated storage. Access isolated storage enumerate all files. Create a txt file under drive C: by invoking “Scripting.FileSystemObejct”, as well as read its content back. 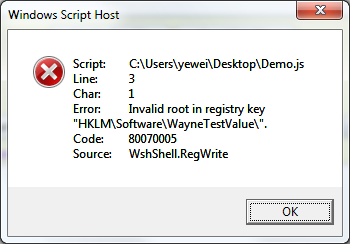 Write registry entry under HKEY_CURRENT_USER, read registry entry under HKEY_LOCAL_MACHINE, by using “WScript.Shell”. 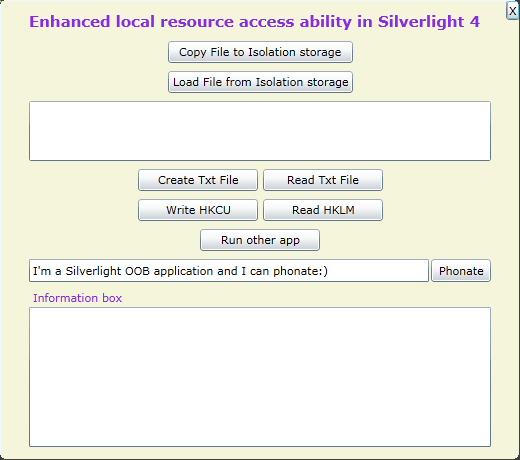 Note: Silverlight OOB application will NOT have write permission to HKLM, it only have read permission. Run another executable files located on the system by using “WScript.Shell”. Phonate a sentence user input into the textbox. // Access local file, registry, COM, etc. OK here we go to see the code behind to implement elevated permission. 3. Registry write/read, please note: we can only have registry write permission to HKCU NOT HKLM, we have read permission to HKLM entries. Note 1: WScript.Shell.Run method can accepts not only executable files, but also accepts *.bat, Windows Script Host files (*.vbs, *.js) or PowerShell script files, etc. If you double click the Demo.js you will success since you are a Windows Administrator, while “Silverlight-based applications run in partial trust, which means they run within a security sandbox“, for more information please refer Trusted Application. 6. Code to implement close button “X” appear on the upper-top corner. This is a little bit tricky, I searched a while on google and found a great article Programmatically exit Silverlight 4 Out-of-browser application. Essentially the code invokes WScript.Shell and runs cmd and terminate sllauncher.exe, so that our OOB process got killed . With elevated trust for Silverlight OOB applications, we can do much more than ever, it give more confidence to develope Enterprise business applications using Silverlight technology, yesterday I saw Scott Guthrie posted a blog talking about Silverlight, he mentioned Microsoft will absolutely continue work hard on Silverlight for Enterprise Businees Applications (both online and OOB).